Reliable storm lanterns provide good illumination. Ice skate in ovals at night in the glistening light of a storm lantern. Available in green, red, black or bronze. At full power these Centennial lanterns emit light almost as bright as a 100-watt bulb and hold 11 hours worth of fuel. With a compact and lightweight design, handle with care to assure many nights of good service. A thumb-activated side lever lifts the globe for easy lighting and wick trimming. The glass covering is thin yet tough, while the knob dimmer helps you control the intensity of the light. 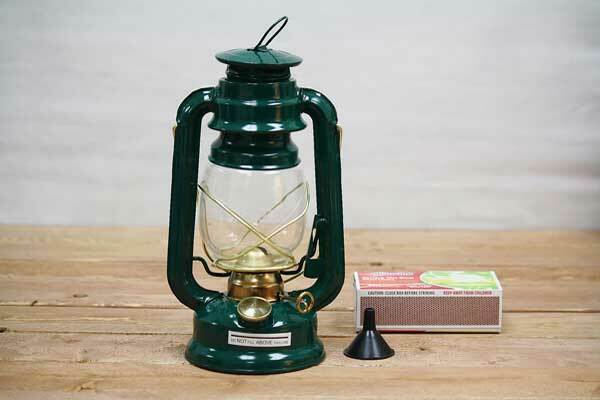 Oil lanterns are made with tin-plated steel sheet metal coated in color enamel or plated in bronze to resist rust. Use handle to hang or carry. Use inside or outside. Made by V&O Lanterns.